The garden is still really not fit to be seen except in close up but at least there are signs of things growing. We have rhubarb that is just about ready to be picked and last weekend I planted some garlic. Aside from that we have a few spring flowers showing their pretty heads, little shoots of hope showing here and there and of course the sun has actually shone a few times this week which always makes things a hundred times better. 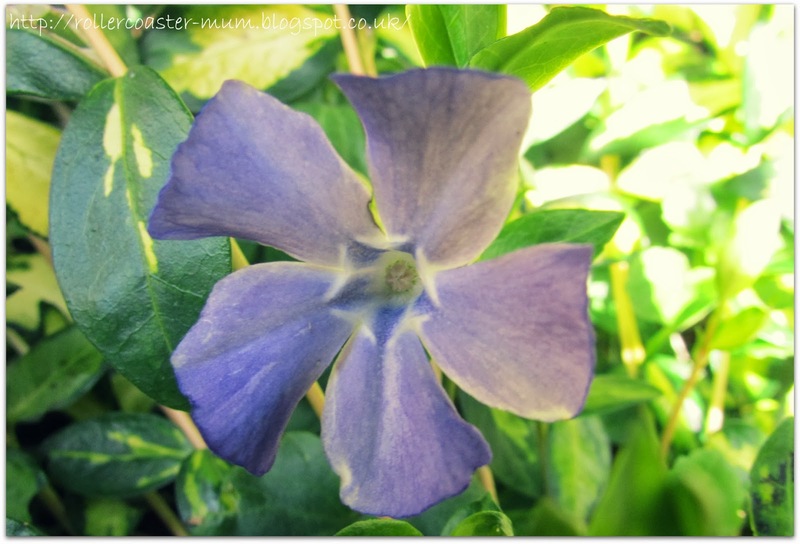 This is one of those flowers that just appeared under our hedge but comes back every year - I think it is Honesty? 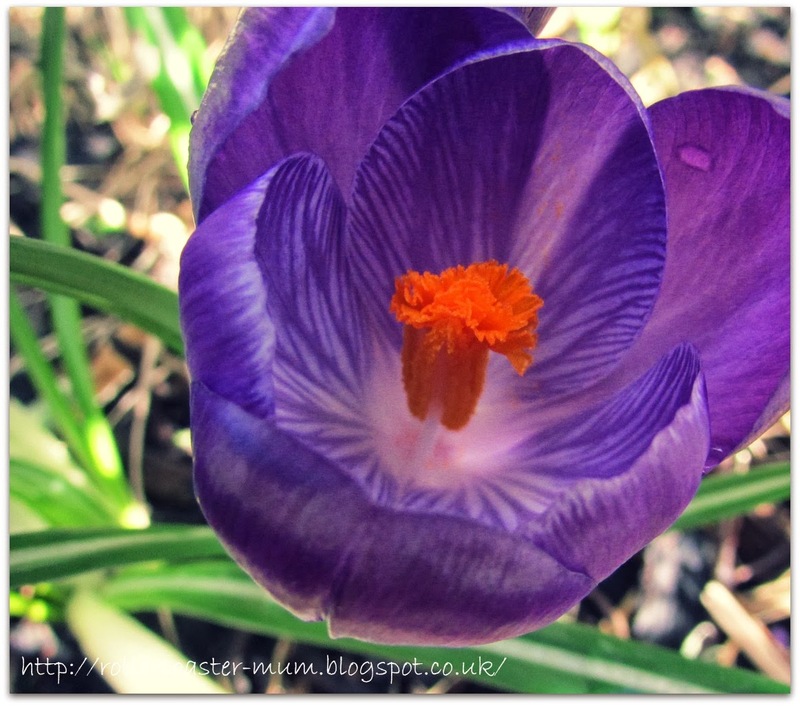 Isn't the inside of a crocus just amazing? 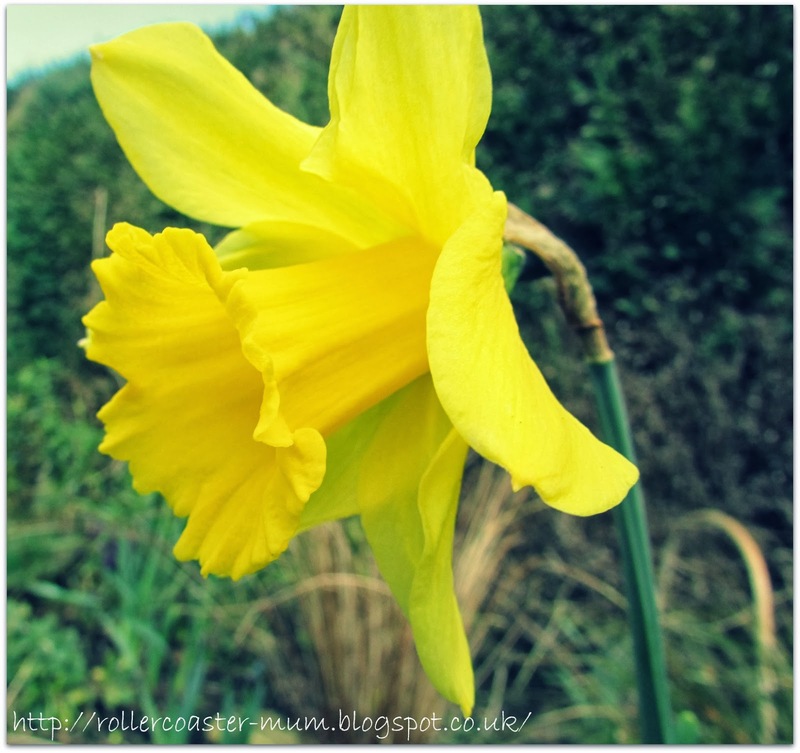 Daffs, being my favourite and all, I had to have a picture of one , although we don't exactly have 'hosts' of them - just the odd one here and there despite planting the bulbs in groups! 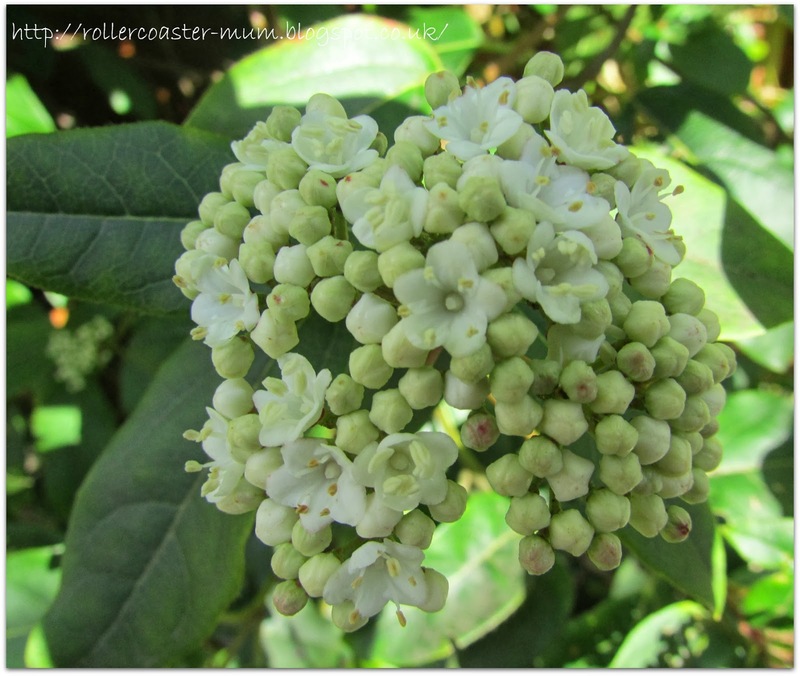 Even the hedge/ shrubby plants are starting to flower - pretty sure this one is a Viburnam. 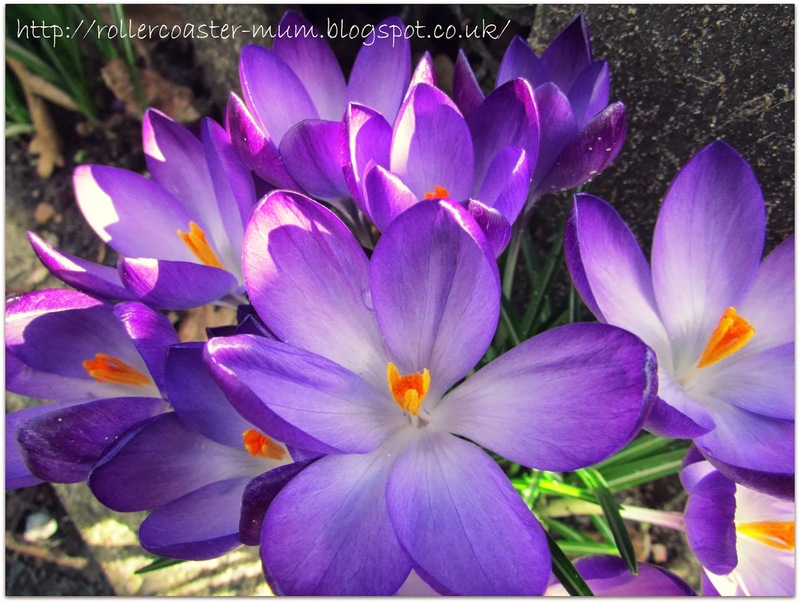 Now we do have hosts of these beautiful crocuses though which is gorgeous. I love seeing them open up their faces to the sun and then close again at night or when the weather is just too bad. 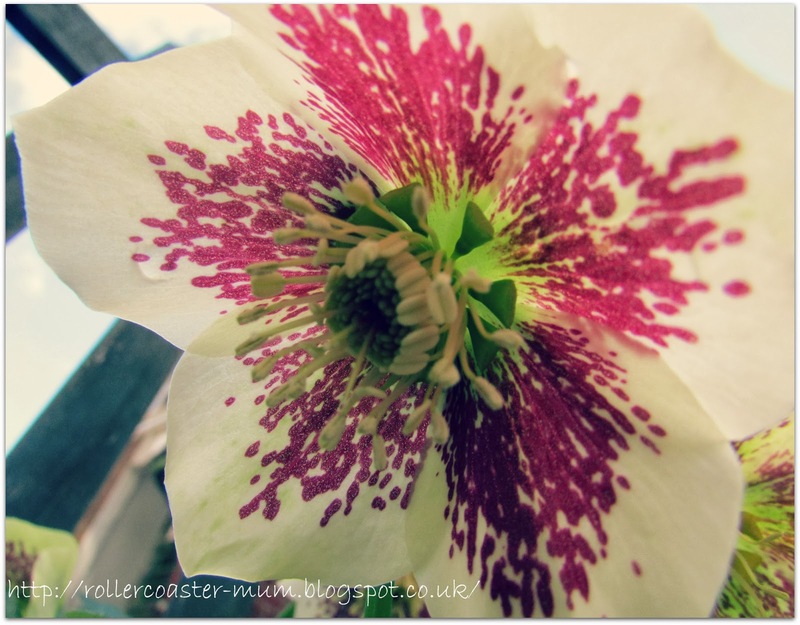 Some of my best loved flowers at this time of year are the hybrid Hellebores or Christmas Roses as my Grandmother used to call them. 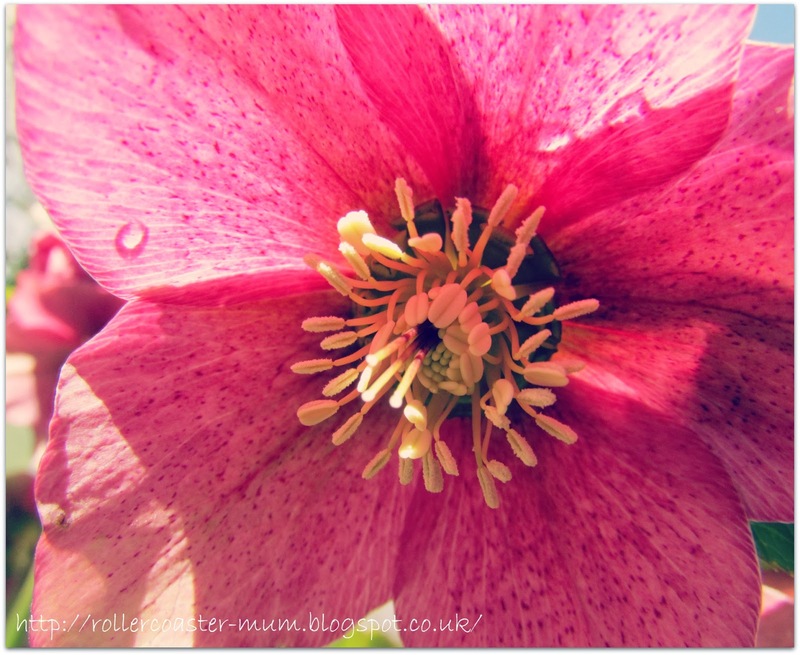 Hellebores come in lovely pinky purples too - I love the detail inside the flowers. 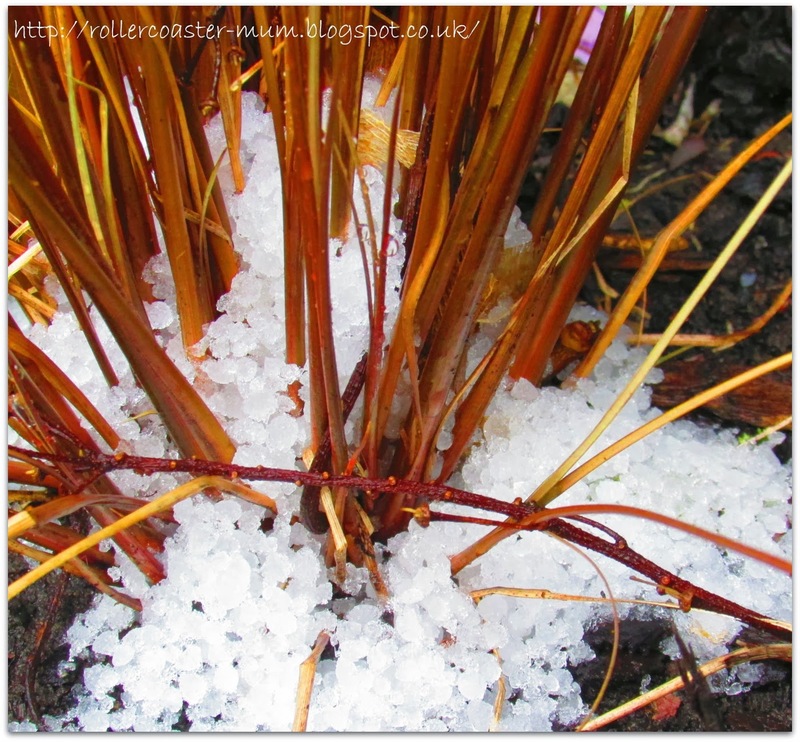 We have had sun but we have also had hail - this lot stayed around for about 24 hours! The grasses don't look too bad from this angle either! 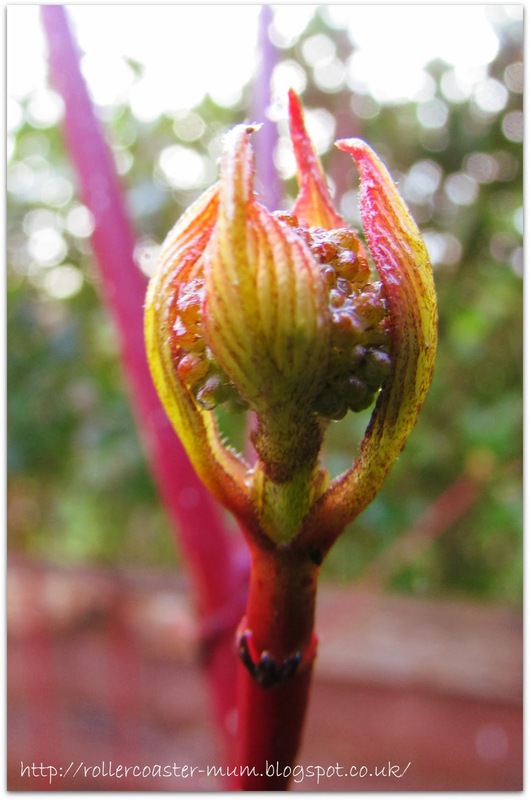 Amazing what things look like in close up - this is a dogwood or Cornus Alba bud. 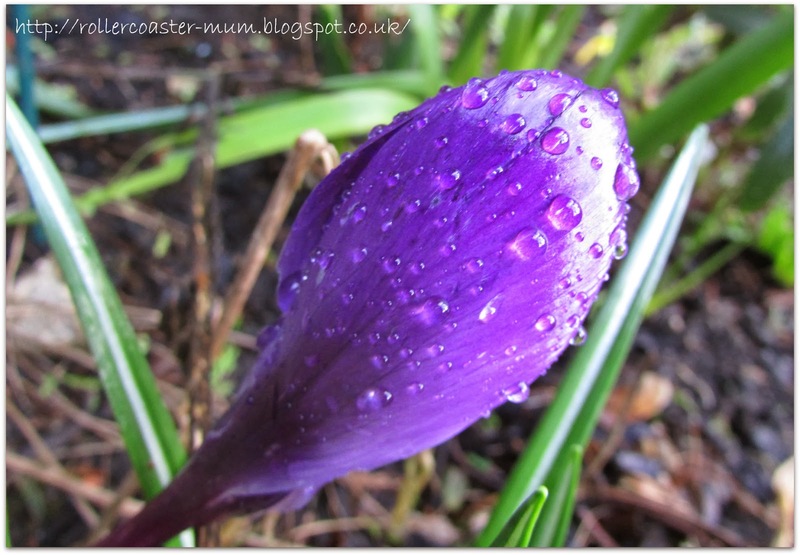 And another purple crocus - this time closed against the grey skies and hail. 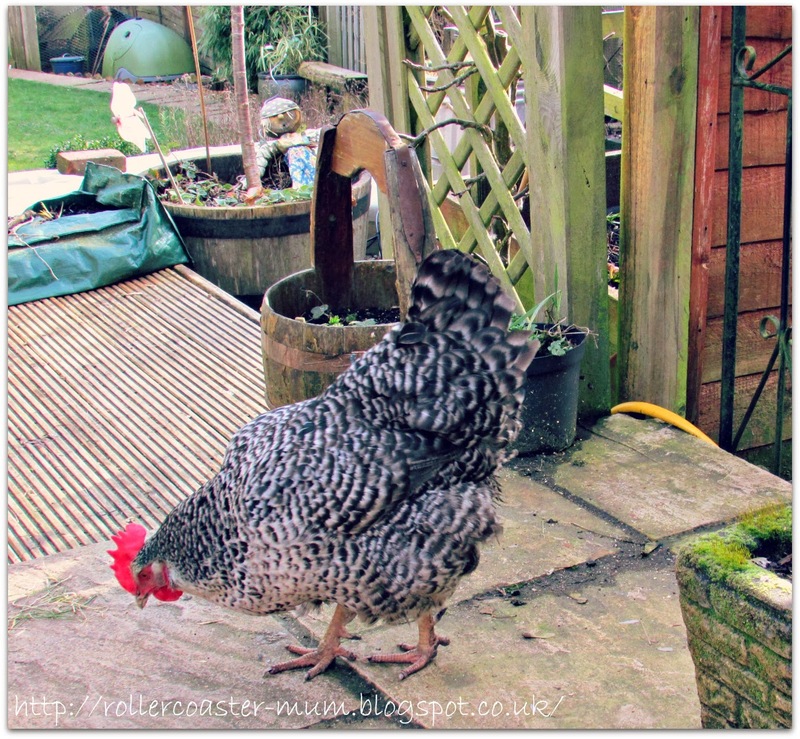 And lastly one of our naughty chickens escaped (and made even more of a mess of the garden) but it did mean I got a good picture of her and you get a glimpse of the less pretty bits of our winter ravaged garden. What a wealth of colour. We had an escaping chook so they are now sadly under tighter restrictions in their coop and run! LOL - naughty chicken. Mine get out from time to time and seem to be able to wreak havoc in a very short space of time! Oh wow, the Christmas Roses are stunning. Love those Hellebores - I could photograph them all day. Your chook looks lovely too - even if she does escape! Yay a chicken - Fab! We had hail like that last week too - it made the herb garden look a bit like it had white ornamental stones on it! I love the bright colours, hellebores are one of my new fave things, I can't ever recall seeing them before until grandad pointed them out to me in his garden. Isn't it great when they all start peeking up their bright little heads? You have a very impressive array of different colours here.